It's that time of year again, when we address the ugliest of rivalries and seek resolution through honest competition. After the success of 2010's Pie vs. Cake tournament, we realized that with just one short season of war, we may find peace. This year, we have to go deeper. Thus we now look to settle the centuries-old grudge between cats and dogs. If pies and cakes sparked the passions of hungry stomachs, dogs and cats stoke the ever-burning embers within each and every one of us, that warmth and light we share with all living things. Brace yourselves. 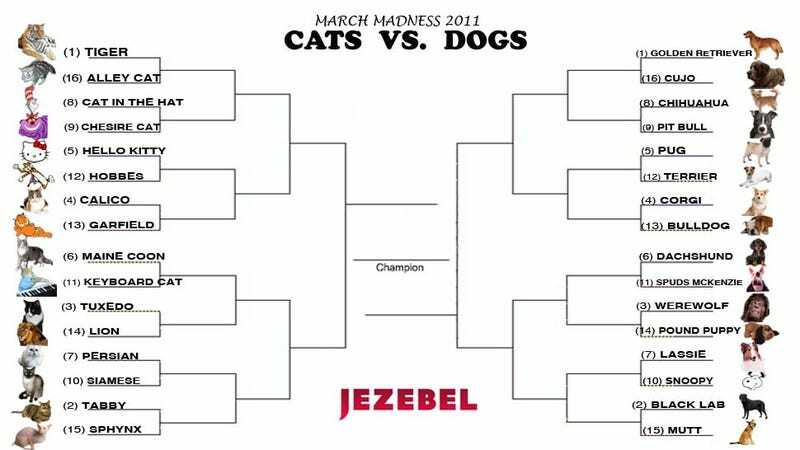 For a printable version of the bracket, go here. After a long and sleepless weekend spent sequestered in a hotel suite, the Selection Committee has emerged to invite 32 of the strongest competitors to battle for its breed. The Committee stands by its decisions; debating the worthiness of entrants or campaigning for players not invited to play will be a waste of your time. The Committee advises that you focus your energies on filling out your brackets. Gameplay will begin tomorrow and continue on every weekday until the championship match, scheduled for April 5. Voting will take place right here on Jezebel.com! 16 canines. 16 loyal best friends begging for your love. 16 felines. 16 independent spirits whose love must be earned. But there can only be one. One beast to rule them all. Even if you're not an animal person, you're likely to prefer cat people over dog people, or vice versa. Or maybe you love both cats and dogs. But now's the time to be honest yourself — you love one just a tiny, almost-imperceptible bit more. A note on the competitors: Some entrants are specifically broad and vague; others are highly specific. Tigers, for instance, may extend to include Tony the Tiger, the Detroit Tigers, Sigfried & Roy's tigers, or the beast in general. But the Tiger does not extend to Hobbes; the Selection Committee has deemed him a strong enough contender to independently play in the tournament. Similarly, Terriers can include all specific breeds of terriers, Toto, whatever. But Team Terrier does not include Spuds McKenzie (a bull terrier), as the Committee believes Spuds McKenzie to have the talent to go it alone. If this is confusing, you're thinking too much. Just let your heart and your gut guide the way.